A couple of days ago, French Prime Minister visited Malaysia, marking this country's importance as France's trading partner. In fact, Malaysia is France’s second largest economic partner in ASEAN and there are some 260 French companies here. A welcomed piece of news to Malaysia's green initiative is that, both nations are looking forward to venture into new areas of cooperation, including Renewable Energy. "My visit is also to look for new opportunities for French small and medium entrepreneurs to come and explore the possibility in Malaysia, particularly in the field of infrastructure, information and communication and sustainability city." - French Prime Minister Jean-Marc Ayrault. Malaysia and France have agreed to strengthen existing cooperations and explore new ones in a move to boost the bilateral ties of both nations. Prime Minister Datuk Seri Najib Razak said both countries were on the same page to explore new cooperations in the fields of renewable energy, biotechnology and transportation. "We look forward to receiving more French companies in Malaysia," he told reporters after a one-hour meeting with French Prime Minister Jean-Marc Ayrault yesterday. 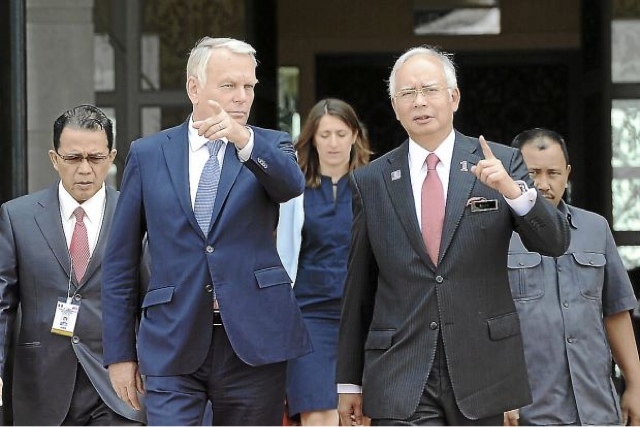 Najib added his counterpart Ayrault had reassured Malaysia that deep understanding and the partnership between both countries would continue in the field of defence. Malaysia also looked forward to receiving some of the acquisition that the country had made including the A400M aircraft and EC725 helicopters, said the prime minister. On palm oil, Najib said Ayrault had told him that there would be no new tax on palm oil and it would be treated on the same basis with other vegetable oil in France.